Staying physically fit and active is a great way to improve your overall health! Whether you are a high performance athlete or enjoy getting exercise through hiking, walking or other various activities, staying active is beneficial for not only your body but mentally as well. But what happens when you injure yourself? Mainstream Western Therapy often treats pain by prescribing a cocktail of painkillers and cortisone shots that provide a temporary band-aid relief rather than addressing the underlying issue. In addition, these painkillers can cause a whole host of other negative side effects such as headaches, nausea, drowsiness and in severe cases addictions. 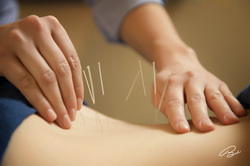 Acupuncture has been used by the Chinese for centuries as the principal treatment for illness. Only recently has the West begun to take note of acupuncture’s powerful ability to heal the body naturally. Even Olympic athletes such as China’s basketball player Yao Ming has incorporated Acupuncture as part of his recovery program after sustaining injuries. When we sustain an injury, what happens to our body? Acupuncture can help treat injuries by addressing the three different stages of trauma: acute, post acute and chronic. and cupping may be used to achieve relief, decrease inflammation, and bring down the swelling. to decrease scar tissue formation. Individuals with injuries that have been left untreated or have suffered for a long period of time fall into the chronic stage. Typically, with lack of mobility Qi deficiency and blood stagnation can result. Massage and Acupuncture are a great combination and work well to bring new blood to the area combined with other techniques mentioned above. Acupuncture can speed up the healing process and have you back enjoying your favourite activities. The next time you injure yourself, think of acupuncture as a natural pain remedy. Call Kelsey to book your Acupuncture Session today!